Publisher: Mud Puddle Books, 2007. Hard Cover, 32 pages, 5.25 x 7.75. Here are recipes that will dazzle and delight beer lovers as well as everyone else. From the Best Coconut Shrimp to My Favorite Drunk Chicken. Start off a meal with the Zippy Beer Dip or the Beer Cheese Soup. Follow that with one of the mouth-watering entrees, Beer-Soaked Chops & Best Yet Fried Onion Rings or the delicious Boston Ale Steamed Mussels. And for dessert try the Pecan Beer Cookies. 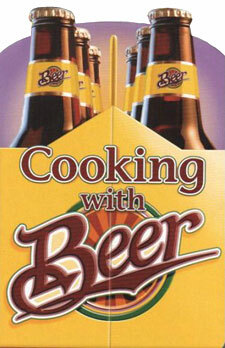 Cooking with Beer is easy, fun and most importantly delicious!